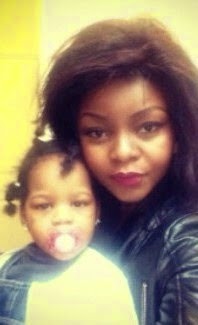 Hi, i am Temi, the mum to the kidnapped child. My 2 year old daughter Liya was kidnapped on the 6th of October 2014 by her paternal grandmother and its been confirmed by the police that she has been taken to Nigeria. Annette Ehiemere , the paternal grandmother, who lives in Port Harcourt with her son(the paternal dad) Izuchukwu Ehiemere ,asked to come visit her granddaughter in April and since she had nowhere to stay I allowed her stay at mine so she can get to know her granddaughter and spend a little time with her, all these I did in good faith. She spent 5 months and all these time I didn’t suspect she was making plans to kidnap my baby, I knew her birth certificate was lost but I just thought it was around somewhere in my room and I would find it, not knowing she had taken it. I resumed at university on the 6th and by the time I got back home, they were gone and after reporting to police it was confirmed that they had boarded a flight to Nigeria. She took my little sister as well and dropped her off at her sister’s in Hackney so I wouldn’t quickly suspect that was what was happening and made her drop my sister off the next day. I had my baby Liya in 2012 and I have been the only one by her side, when I got pregnant and her dad didn’t want her, I told him I know choosing to have her is selfish but I really want to keep the baby and I would take responsibility for her. I have gone through hell taking care of my baby but it was joy to me, she is my motivation, everyone knows how much I struggled to make my baby happy. She isn’t familiar with anyone else, she has never travelled out of the country before talkless of travelling without me by her side. I didn’t even get to hug my daughter goodbye. They haven’t let me talk to my daughter yet, I don’t know exactly where she is. You can’t just take someone’s child away from them without letting them know. I didn’t even get a chance to kiss her. It was one of those days when I was rushing off to school so I just told her bye and dashed out the door not knowing I wouldn’t see her again. My baby must be missing me so much, wondering where her mum who has always been by her side is. I don’t trust my daughter being with them for so many reasons. The grandma is a firm believer of spanking kids, she used to say spare the rod spoil the child and I know that is a usual belief back in Nigeria but I never agreed with her, I used to tell her there are other ways you can discipline a child and told her never to touch my kid again and now I am not even there to make sure that doesn’t happen. I feel like this a bad dream and I am going to wake up soon. I see these things in movies and never thought it could so easily happen to me because I was stupid enough to trust someone who I thought being my daughter’s grandma was automatically family. I can’t survive without my baby. She has never even travelled without me to another town in England here, talk less of another country. I used to have so much trust in the police force and UK boarder agency and never in a million years thought she could be kidnapped in this country and flown abroad without my consent. I am never one to put my business out there because I have always felt like I was strong enough to handle anything that life throws at me because I had Liya to keep me going, now my baby is gone and I am weaker than I have ever been in my life, that’s why I need you to help me raise awareness or get someone to help me. I don’t mind getting Liya back and then going through custody battles with them the right way but the way they took her was so wrong. I miss my baby so much and I need help. what kind of wickedness is this? I can't imagine the pain of being without your kid because one crazy and shameless inlaw came to steal her. if the husbands family felt like the child will be better off with them, there are proper ways to go about custody issues, you cant just STEAL a child for goodness sake! Thank you jare. I pity this poor young lady. Where are her parents BTW? Izu if you are reading this, I pray you and your family never have peace. Any tears this woman cries will be on the head of you and your mother. You have sought what will be your doom if you do not go about this the right way. God will judge you and enough of us are crying to Him to deal with you and your mother. You want to be Naija about this, well we will use the only bone we have, which is God. You are an evil person. If you were so innocent, why did you not travel to see the child. God will deal with that mother of yours.